Justin Kennedy, 2000 BFA Fashion Design Graduate, and Nobue Shinohara, 2001 BFA Textile Design Graduate, have created an impressive list of clients for their company, Kennedy Design Studio, including Calvin Klein, Donna Karan, Marc Jacobs, Ralph Lauren, Zac Posen, Gaelyn and Cianfarani. 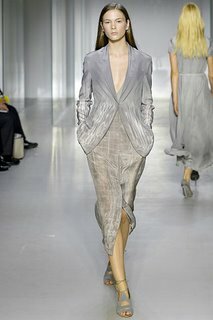 Their own Spring 2008 Collection has been bought by Barneys New York, OTTE, and by george in Austin, Texas. We caught up with Justin after hearing the good news. Thanks. Just got into Barneys as well … working on a project with them. Currently Renee Lee (another School of Fashion graduate) and I are working on the Kennedy Fall 2008 Collection. At the same time, I am developing prints for Calvin Klein and their four Fall 2008 deliveries. (Pre-Fall, Fall 1, Fall 2, and Cruise/Resort). This is my sixth season working with Calvin Klein. I am also teaching online for the School of Fashion. I hear you get some last minute calls from clients. I had done tons of development with Calvin Klein for Spring 2008 and in the end I was told nothing was going to be used. Then I get a call at 4pm on Sunday… the show is 4pm on Tuesday. I had 48 hours! They needed me to come in. They were adding more prints last minute to the collection but didn’t know if there would be enough time. Fortunately, I was in the area finishing up an Academy of Art University portfolio review near Bryant Park so i stopped by to see what they needed. I went back to my studio to start developing, getting screens ready, and printing. They had a car pick up the printed fabric Monday night around midnight and here’s what came down the runway the next afternoon. Wow. Favorite thing about NY … being able to get around the city is very easy and it is the fashion capital of the states. I love the seasons except for the hot humid summer. The second fashion capital of the states … love the weather … very consistent and it’s a clean city. The textile lab and being able to express my own creative style as a designer. Looking at the Maasai Tribe in Kenya and Northern Tanzania. Using the natural way they wrap fabric around their bodies for protection and mixing with a modern New York style. A little mix, match, and drape. Nobby [Nobue] and Amber [their dog]. Marie Antoinette with Kirsten Dunst.